Our Ice is a perfected work of art for our commercial growers, Potency and Yield without sacrificing taste! Not an easy conquest. We spent more time working and perfecting this strain than any other strain we carry. It is one of our top sellers, depending on the year. It’s a Secret Hybrid, but we will share a few ingredients. 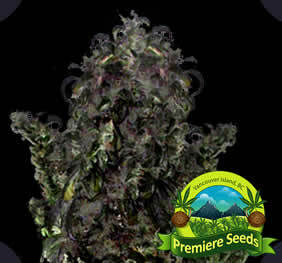 It contains an Afghani Hash mixed with a Secret White Rhino and White Widow Hybrid with concentration on a specific Sativa phenotype. 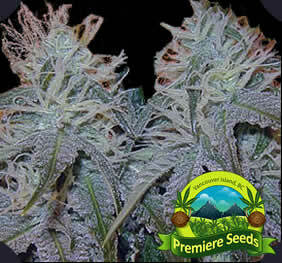 It’s a classic strain perfected by Premiere Seeds BC, with really high THC. Its flowers are intensely covered with white crystals. Ice is excellent for hydroponic growing. The smoke is sweet and the stone very heavy. 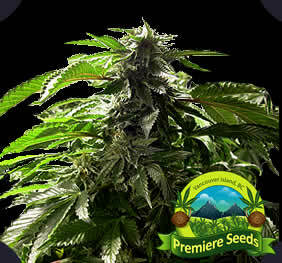 It’s an excellent commercial strain due to the fact it remains short, buds are big and dense. The stone is very potent, just one hit will have you on the couch. lots of crystal production to make it look like ice but not a quality buzz. 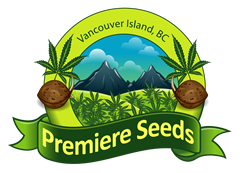 My seeds were delivered as promised and on time and they all geminated, but I know they have better strains here like NL and WW and HP. I’ve grown this and been really impressed, this one not so much.